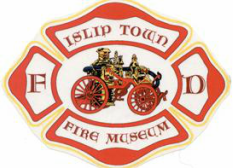 The Islip Town Fire & EMS Museum and Education Center is actively seeking volunteers to assist with a variety of tasks to operate and maintain the museum. These tasks include but are not limited to acting as tour guides for visitors/groups, exhibit preparation/maintenance, research, archiving, general carpentry, etc. No prior experience or training is required and the time commitment is minimal - we will gladly accept whatever amount of your valuable time you can offer us! Museum operating hours are presently Saturdays & Sundays (year-round) from 10 AM - 3 PM. Work details are typically scheduled on weeknights based on the general availability of museum staff and volunteers. For more information or to express your interest in volunteering, contact Historian Tom Rinelli (firescueguy@gmail.com) or Facility Manager Bill Johnson (johnson273@aol.com).